1) Preheat broiler to high. Place chile on a foil lined baking sheet and broil 3 inches from heat for 6 minutes or until black, then turn and cook for 2 minutes. Remove from oven and place in paper bag, let sit for 10 minutes. Peel pepper and discard skins then chop chile. 2) In Dutch Oven, combine chopped chile, wine, shallots, 3 tablespoons parsley, salt, pepper, paprika, garlic, and clam juice. Bring to a boil, cover, reduce heat, and simmer for 8 minutes. 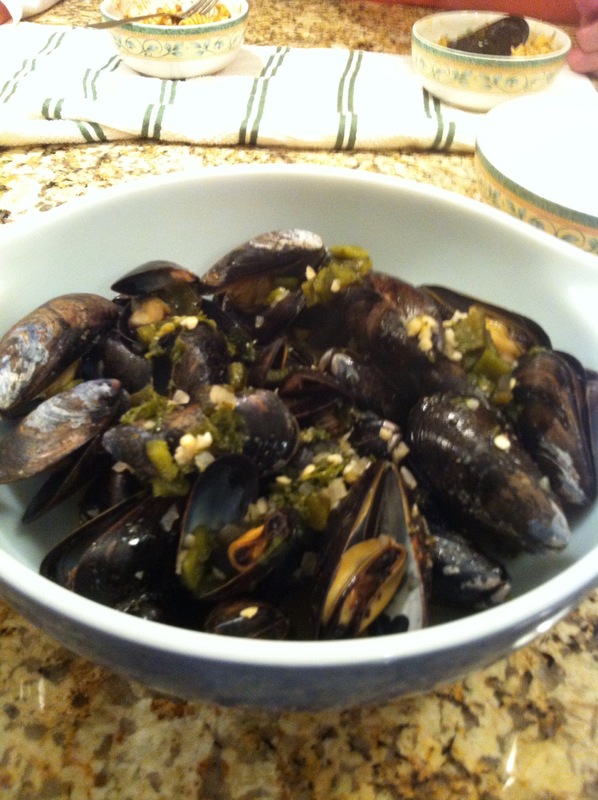 3) Add mussels; cover and cook 4 minutes or until shells open. Then remove mussels from pan with a slotted spoon. Discard unopened shells and keep cooked mussels warm.